hip hip MariusEmkay! Hip HIp MariusEmkay! Just keeps getting better in everyway! Would you please post a pic of the updated loading screen? The screen isn't/wasn't supposed to be like this but I am waiting for Mariusz to know why there aren't the brown above on some of those gfxs that are now the dark gray as it uses the same PMGs as the bottom logo starting at the same xPos so there's no DLIs to be used while loading. Edited by José Pereira, Mon May 1, 2017 2:02 PM. thank you for improvements But Previous music was better. In actual version are some false tones and strange bassline . . ..
Small update with fixed loading screen as Jose pointed out. Are there any differences between your XEX games and ATRs - e.g. XEXs have less pictures etc? ATR has the same xex inside as autorun file, there are no differences between versions. The .atr you can see the loading picture but the .xex is so quickly and used on todays emulators that for this and any other game you're almost instantly on the presentation/credits screen, isn't it? Like many other games, you could display title screen until fire button is pressed. Why no title screen for the executable version? I guess you are referring to loading screen? It is included in xex version, just no chance to see it as game starts immediately. I'll change that in future releases. Yes, technically it's a loading screen. Like I said on other topic I'm not into the need of pressing a key and that is because in the old days that didn't happen. Point me a game where that happened because I can't remember of any. And I'm talking about 'real' loading screens that is when showing while the loading process is going on. -> Tape version: The A8 tape loading process is so size of tape consuming that a 5min game on others on A8 goes to 3x or 4x more. Now imagine with the picture? And also the price of 60mins or even 90mins tape when others could normally go well on a 20mins (2sides x 10mins) and some games even on 2x5mins. How much would increase the price and was it profitable and more in a small users market like the A8. -> Disc: The size of a normal type A8 formated disc. -> On the two versions: Regarding the size of the A8 community back then and the own way of we to need to have the loading screens without any DLIs makes them the only way possible is to have them in 4colours only GR.15 bitmap mode and like me is doing now that is adding some but not much more colours is by adding the PMGs but that wasn't too much known on the past, G2F didn't existed and again number of users were so small that it wasn't really to bother not only for loading screens but also for the in-game like we all know on all all those 'sh..' releases that we always got . 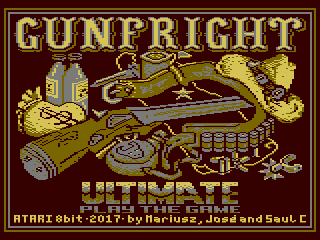 And what bad and uggly 4colours conversions we got when there was a loading screen... And what troubles and how much time and possible not payment had, maybe usually the original C64 artists to get the A8 picture ? But to return and finishing my point of view and idea is why not have on the code a 3 or 4secs showing the screen and then start the loading with, like now, the screen shown while loading? Is this enough and would apply to all be happy and see my beautifull creations/stollen/conversions ? If this isn't enough then have this and for people that can't wait to play the game and/or don't like my work also have a 'press any key to continue' possibility. P.s.- But and why people don't choose the .atr if they want to see and have these pictures screens seen while loading instead of the .xex? Today all these games are for disc version, don't take all that too much time and everyone can always set the emulators to pass/emulate or not the real time the loading takes. Will any here ever read all I wrote? 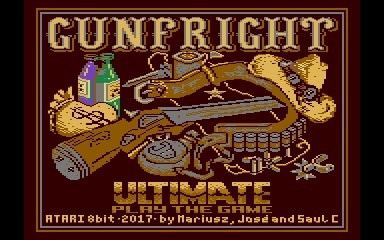 Edited by José Pereira, Sun May 7, 2017 1:52 PM. And I'm right now at my door, the phone already 'said' it has low battery but also I need to eat and is more than time for dinner so you can finally be happy that, at least in the next hour or so I will and can't say anything more in this topic and on all the others . Edited by José Pereira, Sun May 7, 2017 2:10 PM. Jose, there should be no "gap" (like 3-4 seconds) during loading as this may break loaders, modern ones, as well as old ones. So, the only option is to make pause after game is loaded, and allow this pause to be skipped with keypress. I understand your point with "old school" loading screens and I like them, and this is how loading screens were implemented in my games. 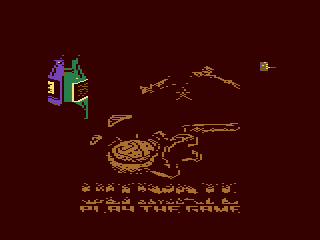 But it is right that people with newer hardware for storage connected to Atari do not have a chance to see loading screen, so I'll implement this pause after game is loaded for people to have a chance to actually see these screens. Ah I see Mariusz that is after loading and not before the main game starts to load. I prefer and never thought of it. But after load can't you have the two: gap and keypress? Aren't you saying that after load is possible to have the two? I think you are. Everyone should be happy but it could be a real pain for the programmer of the game I want to keep the coder/programmer happy! 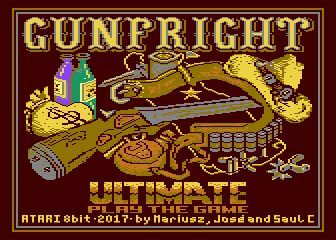 I never played Gunfright before (e.g. on another system), but when I played it yesterday, it showed garbage after a while. Okay, I was evil and just killed people that were walking around and after I killed 3 or 4 people and also got killed several times, garbage appeared on the lower/bottom display. Alright, you should not walk around and kill innocent people, okay - but then again the game should not display garbage after a while. Mariusz, can you please fix this ?!? Edited by CharlieChaplin, Thu Jun 8, 2017 12:57 PM. I attached fixed version (1.2).